Guys (and gals), I’m really sorry for being M.I.A. Life has all of a sudden become even more of a crazy, busy, (mostly) fun, adventure! This means I’m slacking in the blogging department, and will likely continue to do so until the end of November. That’s when life will calm down, and I can focus on things like writing to you lovely people! Bear with me. In the mean time, I’ll keep your eyes fed as much as I can! Start with these mushrooms. Really, do it. Portabella or portobello? Who knows. According to food.com, the Mushroom Council (um, awesome?) has decided on “portabella” as the correct version of the word, although both are widely accepted. I’m a rule-follower, so we’ll stick with portabella. 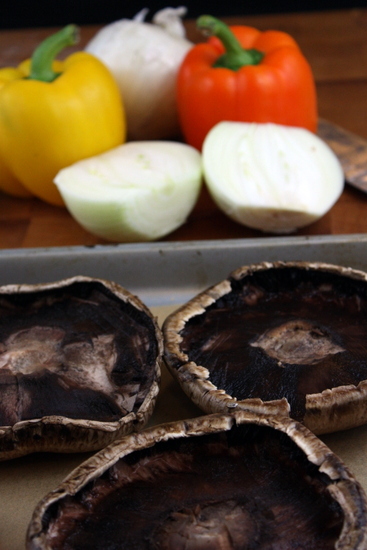 Portabella mushrooms = vegetarian steak delight. I almost never cook mushrooms, except like this, because I neither love nor hate them; however, portabella mushrooms are a different category altogether. They’re so thick and meaty! You can make a meal out of them! 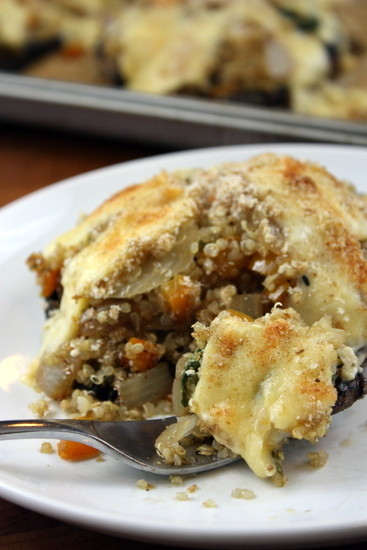 When stuffed with quinoa and veggies (and of course, topped with cheese!) you have a pretty seriously awesome dinner. I think you could (and should) probably throw these on the grill too — a skill I’m slowly learning to master. Side note: I made THE BEST grilled chicken on the grill the other night (my first chicken-on-grill attempt). Juicy, delicious, amazing. Maybe I’ll share one day. After a recent Costco trip we found ourselves with a pack of five portabella mushrooms (how does that always happen!? ), and I figured I might as well just make them all at once. Little did I know Derek would end up eating THREE OF THEM in one sitting. That man can eat, I tell ya! And he claims he doesn’t even like mushrooms (and he CLAIMED he didn’t like quinoa when we started dating — I sure taught him!). Sautee up some veggies, throw in some herbs, mix it up with cooked quinoa, throw it in a mushroom cap, top it with cheese and BOOM: dinner. Delicious dinner. Prepare quinoa as directed (1:2 quinoa to water ratio). Prepare the mushroom caps by rinsing and gently scraping out the gills. Drizzle with olive oil, and bake for 10 minutes on a parchment-lined baking sheet. Over medium heat, sauté the onion, garlic, and bell pepper with for 7-10 minutes. Add the spinach at the end, and cook until just wilted. Remove from heat and mix with prepared quinoa. Gently spoon the mixture into the partially cooked mushroom caps, top with plenty of cheese, and bake for another 15 minutes, or until the cheese is fully melted and begins to brown. yum! 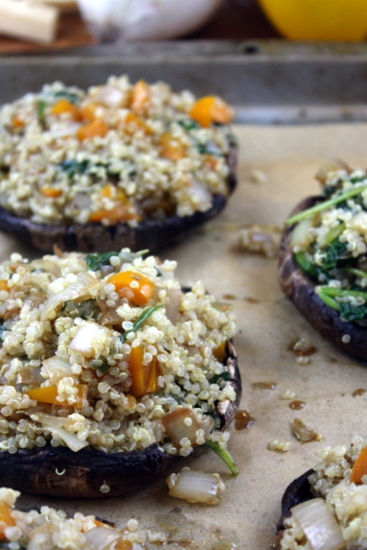 i stuffed pepper once with quinoa – i love using portabellos instead! I made a vegan version of this using broccoli and tahini & miso sauce today and it was awesome! 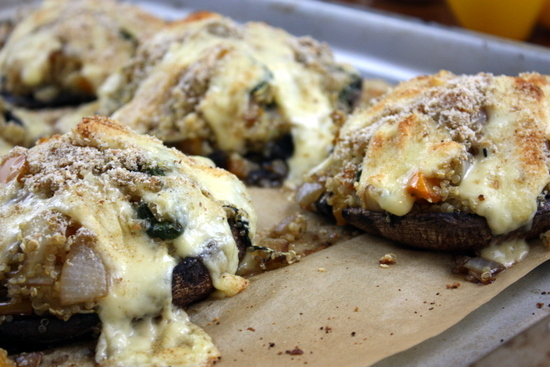 Will definitely be trying it with spinach as soon as I buy some (and more portabellas!). 🙂 Thanks for the great recipe and inspiration! Fabulous! I’m glad you liked it — your version sounds delicious! 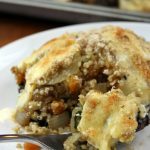 I’m loving your quinoa recipes, this looks pretty easy and definitely delicious! Yum!! Glad you liked it, Dani!